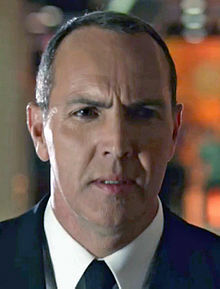 آرنولد وسلو (اینگیلیسجه: Arnold Vosloo) آمریکالی اوْیونچو. ۱۶ ژوئن ۱۹۶۲ ‏ ایلینده دۆنیایا گؤز آچیب. 1984–گۆنوموز ایللر آراسیندا سینما ساحه‌سینده چالیشیب. 1992 Red Shoe Diaries Bill Episode: "Double Dare"
1995 American Gothic Rafael Santo Episode: "A Tree Grows in Trinity"
1995 Fallen Angels MacMan Episode: "Fly Paper"
1996 Nash Bridges Alex Abe Episode: "Genesis"
2000 Charmed Darklighter Episode: "Murphy's Luck"
2004 Alias Mr. Zisman Episode: "Crossings"
2007 Shark Andre Zitofsky Episode: "Gangster Movies"
2010 Psych J.T. Waring Episode: "A Very Juliet Episode"
2011 Young Justice Kobra (voice) Episode: "Drop-Zone"
2013 Elementary Christos Theophilus Episode: "Heroine"
2015 Grimm Jonathon Wilde Episode: "Maréchaussée"
2016 Criminal Minds: Beyond Borders Armand Smit Episode: "Iqiniso"
2017 Voltron: Legendary Defender Ulaz (voice) Episode: "Shiro's Escape"
2019 The Blacklist Marko Jankowics Episode: "Marko Jankowics (No. 58)"
اینگیلیسجه ویکی‌پدیاسی‌نین ایشلدنلری طرفیندن یارانمیش«Arnold Vosloo»، مقاله‌سیندن گؤتورولوبدور. ( ۲۲ ژانویه ۲۰۱۸ تاریخینده یوْخلانیلیبدیر). قارداش پروژه‌لرده آرنولد وسلو گؤره داها آرتیق بیلگی‌لر تاپابیلرسینیز.